Bell sleeves just might be my favorite fall trend. They add an extra sass to an outfit and I just loved this dress the second I saw it. The A-line style of this dress would look great on ANYONE. It is seriously so flattering and comfortable. Because the dress itself is relatively plain, it can so easily be styled several different ways. I love this cute hat and OTK boots for a day at a brewery or walking around an apple orchard (SO fall, am I right?). I love this dress for work as well. Unfortunately, I don’t get to wear cute hats in my line of work, but I love this look just as much. 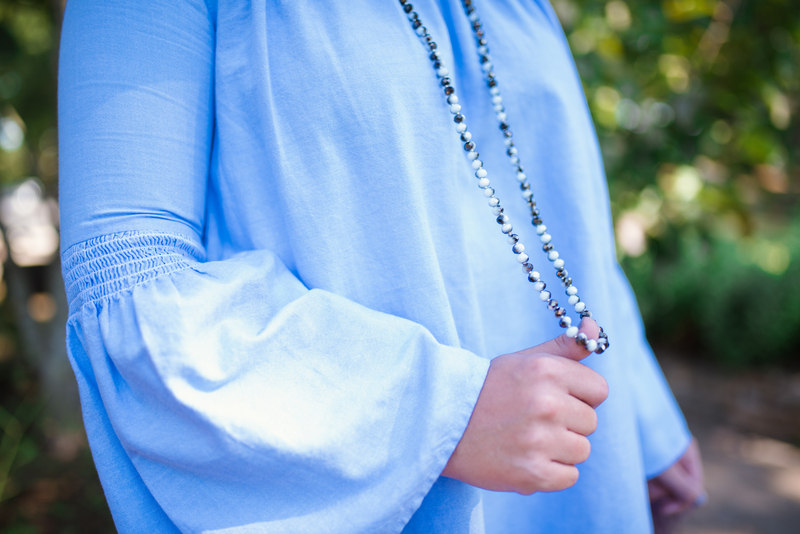 Layering necklaces is so simple and this dress is perfect for that. I also paired it with some statement earrings and booties and VIOLA! This dress is so stinking cute and I will definitely be wearing it all fall. I love being able to incorporate a hat into any outfit and, even better, I like to be able to change it up to wear to work. This dress seriously does it all… and it’s 50% off right now! I hope everyone is finally transitioning to fall like we are in North Carolina. It’s feeling so great and I’m loving that I finally get to wear boots! Anyone else feeling this too? Thank you so much! I’ll definitely check out your blog!